I know its early but may as well get this underway considering we had our first fire of significance last weekend near Marlo in the states SE which was at Watch and Act Level and I like to have these threads as a bit of as a way to document the season and look back on. 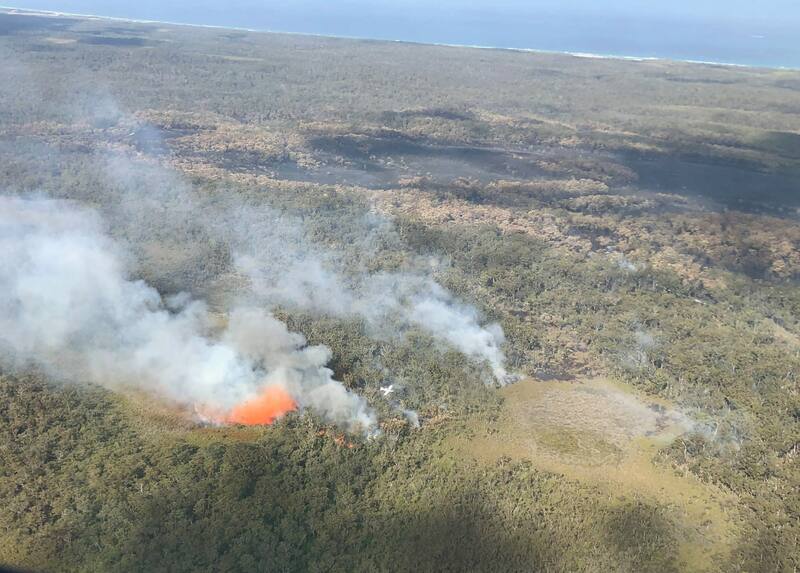 Here is a photo from this fire today, concern is that it is burning in area's of peat which without heavy rain may cause issues later in the season when things really heat up. Burning well enough into the wind. Record-breaking low rainfall in parts of Victoria is forcing the Country Fire Authority (CFA) to bring forward the start of its bushfire season. The agency has released its bushfire season outlook, and is warning Victorians to prepare for an extreme summer of fires. For the first time, fire restrictions will be introduced in Gippsland as early as September. CFA chief officer Steve Warrington said the season looked like it would be the worst in a decade. "Our primary concern is Gippsland, the north-eastern parts of Victoria as well, the Otways and certainly along the Murray," he said. "At the moment if we go on the current forecasts, and to some extent it's crystal balling, but the dams are down, the water content in the ground is quite low. "Large parts of the state have been in a few years of drought now." Conditions in parts of the state, including East Gippsland, are the worst firefighters have seen since Black Saturday when 173 people died in February 2009. "For the first time ever we'll introduce restrictions in Gippsland as early as September," he said. "That will take us right through to potentially April next year, so start early, finish late. "The conditions for this time of the year are really quite concerning for us, and that's unfortunately already being realised." Fire authorities are expecting a severe or extreme fire season across much of the country this summer. Mr Warrington warned that could leave Victoria unable to call on firefighters from interstate for help. "Our ability to support each other is diminished," he said. "This year we're planning as if Victorians are predominately going to have to look after ourselves, the support won't necessarily be there as we're used to. "If it starts early and finishes late, it means fatigue issues for us â€” long campaign, lots of expectation." About 140 firefighters have been battling a blaze burning at Cape Conran, in the state's east, since Saturday. It is one of more than a dozen burn-offs that have escaped from private properties this month. Victoria's Department of Environment Land Water and Planning incident controller Ben Rankin said the conditions were drier and more volatile than normal. "This is most unusual to have fires run to this extent in winter," he said. 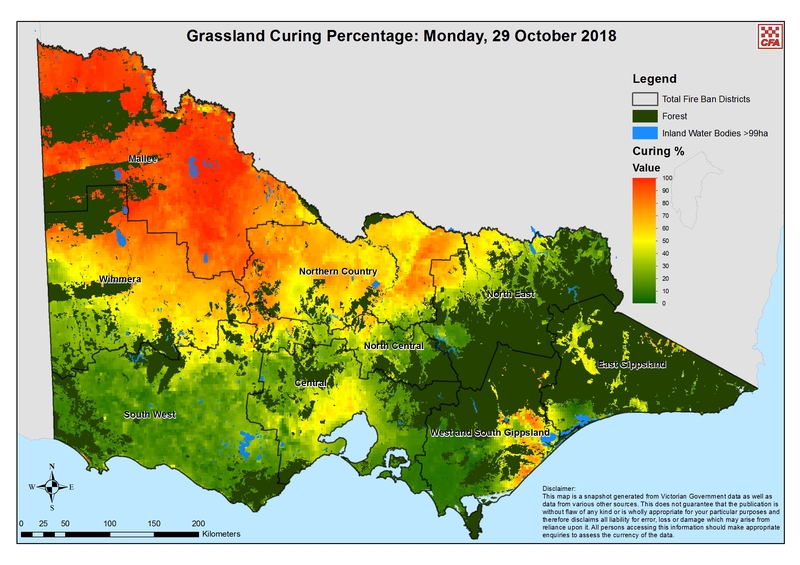 "The fuel and the countryside in East Gippsland at the moment is excessively dry." Mr Rankin said the ground was drier now than it usually would be in summer. Rainfall totals are at record lows in part of East Gippsland, and combined with the early fire season landholders are growing concerned. Josh Puglisi's Cape Conran property is adjacent to the fire. "We have a dam in our front yard and that was dug probably 12 years ago and it's been full every year," he said. "This is the first year it's got virtually no water in it. "We've got fire pumps on our dam, but we've got no water to pump. "Everyone's talking about how dry it is, everybody from farmers to some old retired couples who live in this area." The nearby Snowy River Campus School for Student Leadership is tucked away on a grass field surrounded by forest near Marlo. Principal Robyn Francis said the school's fire equipment had been set up earlier than ever before. The school has five water tanks for firefighting, a backup generator, and a deluge system to spray water over the school buildings if a fire threatens. "We usually have it in terms one and four, it's always up in those terms. This is the first time we've set it up in term three," Ms Francis said. The whole eastern seaboard will be a tinder box.Could be unprecedented. "The Chief Officer has approved the declaration of the Fire Danger Period for District 11 to commence 0100hrs on Monday 10th September"
D11 is East Gippsland - this marks the earliest fire danger period declaration for any reason in state history. Yep 10. But I heard this morning that Wellington Shire Council might declare restrictions for this area anyhow. Heard 10 & 11 to be declared 10th Sept. Rapidly developing fire at Bonang in plantation, request for support and as many trucks as possible, 2 forestry fire fighters injured and going to hospital. Fire can be seen on latest bom satellite - meanwhile it might be snowing up there later today. This Watch & Act message is being issued for Bendoc, Bonang, Cabanandra, Dellicknora, Tubbut. There is a bushfire at Tubbut that is not yet under control. Firefighters have been unable to stop the fire preading. Enact your fire plan. The current weather conditions are making the fire difficult to control. Conditions may change and get worse very quickly. If you leave remember to take your pets, mobile phone and medications. If travel to the home of family or friends that are away from the warning area. Keep the roads clear so emergency services can respond. If you are away from home do not return. Monitor conditions for changes in the situation. Bushfires can spread quickly and are extremely dangerous. Trees can fall across roads and cause dangerous driving conditions. 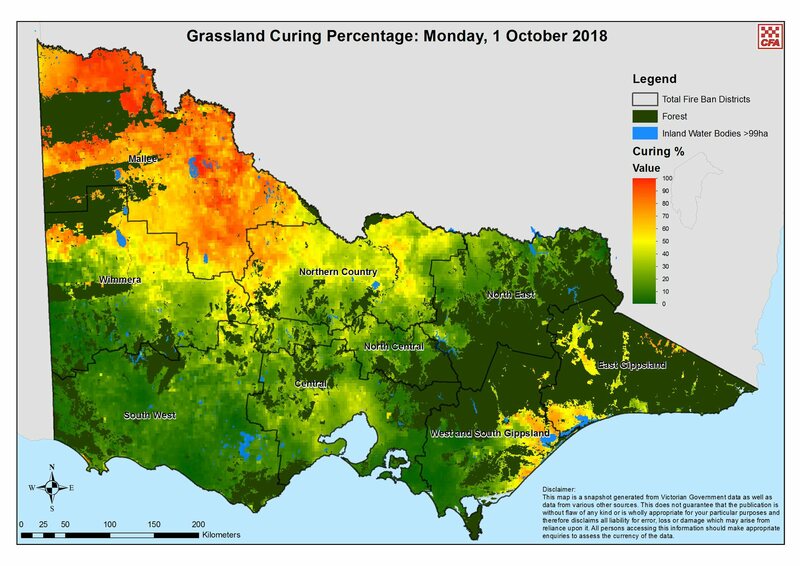 The First Grassland Curing Map for the year. Newcomer to this forum, very interesting. I believe this Summer will be kind of bad for fires in various parts of the state. Looks like parts of Gippsland are drying out quickly too. Have read in this seasons bushfire hazard Report by CRC that a lot of Gippsland & the Eastern part of Melbourne are the most at risk of fires this summer. Has certainly been very dry lately alright. I have had a keen interest in weather events for a long time, and also enjoy monitoring the emergency services, radio & EAS. quite unseasonably given we are just coming out of Winter. vehicles, it's being taken seriously! Bit of a fire going up at Talbotville in the ranges, aircraft which were doing a training day at Latrobe have been deployed for a bit of real world action. 7 registered (mysteriousbrad, ol mate, Sandbank, Sidney, Adaminaby Angler, Homer, Werner K), 59 Guests and 3 Spiders online.